Aside from the Shipley brewery, which is believed to have lasted for nearly a century, the brewery that remained at one location for the longest period of time was located at 5th and Adams Streets in Wilmington. It later became known as the Diamond State Brewery and was operated by the Stoeckle family for more than 50 years. 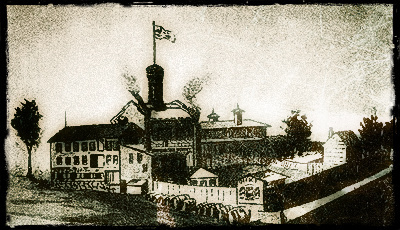 A complex that would in time become the largest brewery in Delaware had very humble beginnings. In 1859, three young, enterprising brothers from Newport, Delaware, Aquilla, George and Samuel A. Nebeker, purchased an abandoned quarry site at 5th and Morrow Streets. After excavating for lager beer storage vaults, S.A. Nebeker and Company built what was at the time the only commercial brewery in Delaware. The company maintained an office and branch saloon at the corner of 4th and King Streets. Nebeker’s lager beer was popular products with local saloon owners. Unfortunately for the company, the Civil War intervened. All three of the Nebeker brothers served at one time or another in the Union army. Additional pressures came in the form of federal taxes and licensing fees imposed on brewers to address the growing national debt resulting from the war, along with grain rationing. Local competition also increased in 1866 with the opening of Hartmann & Fehrenbach’s large brewery across town. In 1869, Aquilla left the business to become a surveyor, leaving Samuel and George to run the brewery. The two decided to shutter the business in 1871 to pursue other business interests in Philadelphia. After the dissolution of the Nebeker enterprise, a group of local investors purchased the property with the intent of continuing in the lager beer business. A. Bickta and Company was organized in 1872 and comprised of Wilmingtonians, Augustus Bickta, his brother Frank, James Clark, Edward McManus, James Murphy and Joseph Stoeckle. Among the members of the new firm, only Stoeckle had practical experience with brewing. His skill and general interest in the business led to his appointment as the brewery’s general manager. The Bickta firm greatly enlarged and improved upon the old Nebeker plant, updating it with the most modern brewing appliances available. The brewery was named the Diamond State Brewery, likely after Stoeckle’s Diamond State Hotel at 223-225 King Street. Though the brewery was well-outfitted, annual output never managed to exceed 4,000 barrels. In August 1874, Augustus Bickta resigned from the company and it re-organized as Bickta and Company. Sixteen months later, Stoeckle and his brother-in-law, Frank Bickta, purchased the interests of the remaining three partners. Sadly, only sixteen days into the new partnership, Bickta died suddenly. Stoeckle bought out Bickta’s interest, making him sole proprietor of the brewing company. Joseph would prove to be more than a capable owner, as he proceeded to build a brewing empire that would last for the next 45 years. A native of Buchau, Württemberg, Stoeckle arrived in Wilmington in 1854. After working briefly as a laborer, he entered the hotel and saloon business with his wife Johanna. Joseph learned the art of brewing from his brother-in-law, Gebhard Mutschler, and the two started a small lager brewery in 1859 at the rear of Stoeckle’s 225 King Street saloon. The annual capacity of the brewery was only 2,000 barrels, as sales were limited to saloon patrons. The brewery ceased operations a little more than a year later when Stoeckle became ill. Joseph continued to expand his saloon business and, in 1871, he also began operating a tavern at Schuetzen Park, horse racing grounds and park on the city’s western edge. He then became associated with the Bickta company and left Schuetzen Park. 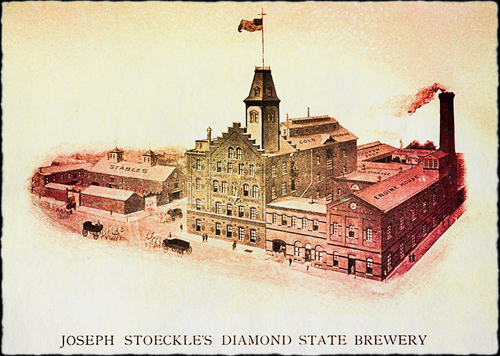 After taking control of the Diamond State Brewery, Stoeckle slowly grew the business throughout the remained of the 1870s. By the end of the decade, the brewery was turning out 4,555 barrels of beer, making it a close second in production to Hartmann & Fehrenbach. After a fire destroyed the brewery in 1881, Stoeckle rebuilt a considerably larger brick brewery complex, complete with a statue of Gambrinus perched high above the brewhouse’s exterior. Throughout the 1880s and into the early 1890s, business continued to prosper and grow under Joseph’s guiding hand. 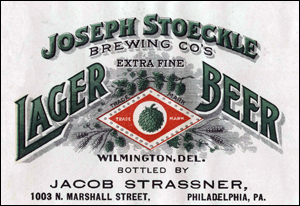 Stoeckle’s Extra Fine lager and porter were distributed extensively in Delaware, along the Delmarva Peninsula and into southeastern Pennsylvania. By 1893, the brewery was producing 30,000 barrels a year for saloons and bottling houses. Stoeckle, who had contracted tuberculosis a few years earlier, was taken by the disease in 1893. Control of the brewery was passed to his wife, Johanna. The Stoeckles’ son, Harry, who had received formal training in the brewing industry and had long been associated with the Diamond State Brewery, assumed a larger role as its general manager. Long a driving force behind the Stoeckle family’s great success and fortune, Johanna Stoeckle continued to grow the business during tough economic times and into the new century. When Johanna died in 1902, the remaining Stoeckle heirs made the decision to incorporate the business as the Joseph Stoeckle Brewing Company, Inc. It was a mere formality that Harry would be nominated as company president. Under his management, the brewery prospered more than ever in spite of stiff competition from other local, regional and national breweries and the growing temperance movement. Continued capital investments and upgrades allowed Stoeckle to further expand their market into New Jersey and Maryland. The brewery was turning out more than 1,000 barrels a week in the first decade of the 1900s, making it the largest brewery in Delaware. The Diamond State Brewery continued to survive, even after 1907, when beer sales were prohibited in Kent and Sussex Counties. in 1919, which allowed the brewery to continue producing beverages after the enactment of Prohibition. After the initial success of Stoeckle’s Golden Hop cereal malt beverage (‘near beer’) and soda, product sales began to diminish. Harry managed to sustain the business until his death in 1925. A group of Stoeckle heirs and long-time family associates then assumed control of the company but were unable to keep it afloat. In 1926, the Joseph Stoeckle Brewing Company went out of business.